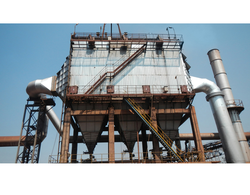 Manufacturer of a wide range of products which include electrostatic precipitator. To manufacture this Electrostatic Precipitator as per the set industry norms, the latest technology tools and equipment are used. Due to low power consumption and excellent performance, the offered range of electrostatic precipitator is highly demanded. To ensure a zero defect, offered range undergoes series of quality assurance procedures.